The Co-Op Bookshop features Destination Saigon this Mother's Day! 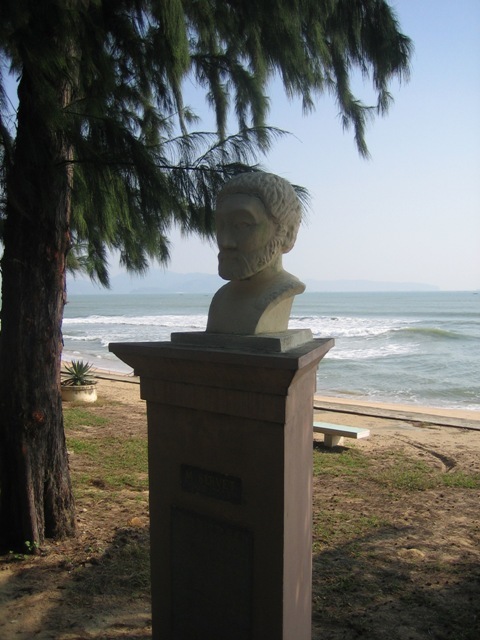 Being a large man taking up a space usually occupied by three Vietnamese, writer Walter Mason was obviously an easily noticed foreign visitor in Hanoi and Ho Chi Minh City (aka Saigon). 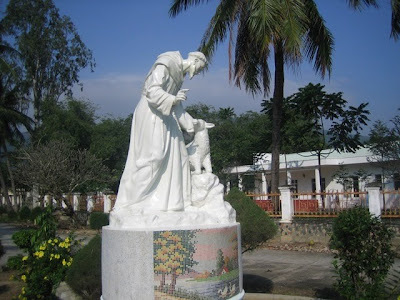 Indeed the cheerful insults he often got about his size add to the charm of his account of three months travelling through Vietnam. He falls through plastic chairs, breaks floor tiles and gets run down by an elderly female cyclist, all occasions which give much merriment to the locals. 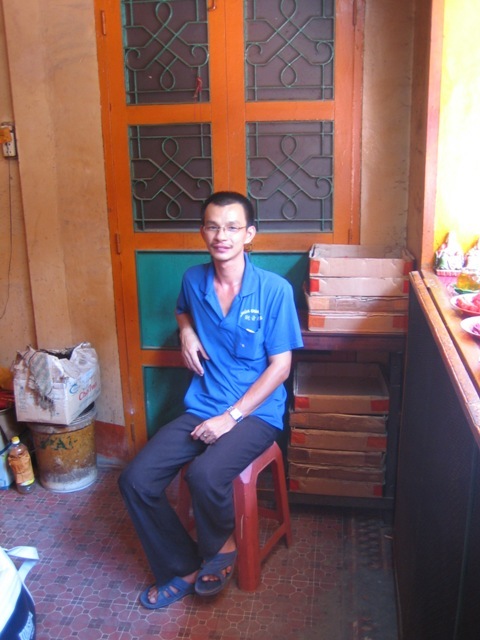 Thanks to a partner who is Vietnamese, Mason is a fluent speaker of the language, able to attend a university in Ho Chi Minh city, which he describes as "a kind of oriental LA without the celebrity". 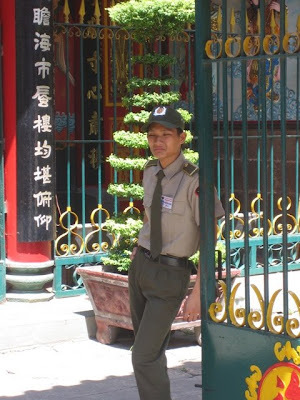 Fluent he might be in the words, but not in the ways of the 10-year-old boy in the Hanoi Ambassador Pagoda who cons him out of a set of amber prayer beads and then has the cheek to ask for money. There are many such delightful moments as Mason wanders the countryside discovering a people who live by their wits, kindness and beliefs. The publicity for Destination Saigon continues, and in some of the most unexpected places. 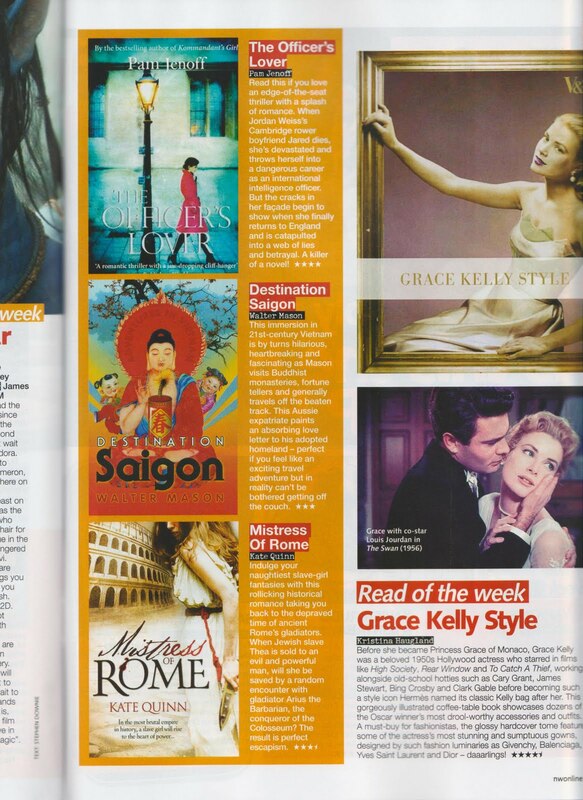 A friend of ours told us about the review in the current edition of NW magazine! I love this photograph, which was taken at my friend's temple in Binh Dinh. 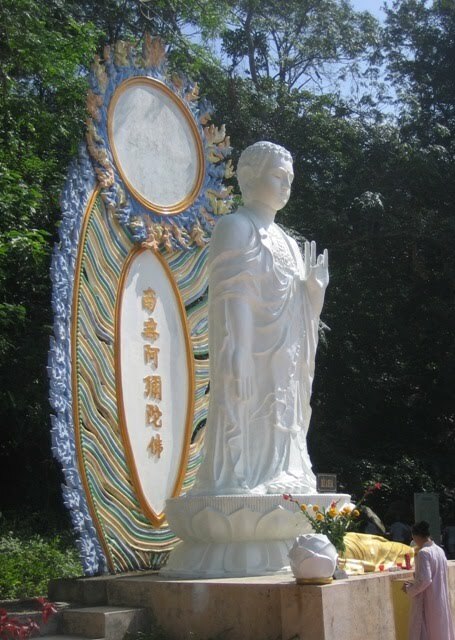 Quan The Am (Kwan Yin), the Bodhisattva of Compassion, stands on the lower terrace, and Di Lac Phat, the Buddha of the Future, stands on the upper terrace above her. For me it represents two important qualities, qualities which my friends in Vietnam always seem to embody: Compassion and Hope. 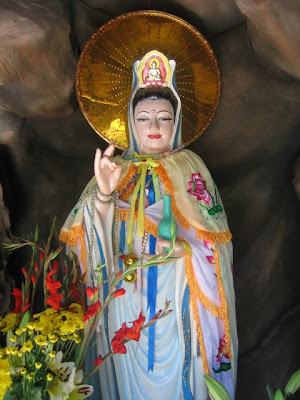 Quan Am is the Gentle Mother, the Hearer of the Cries of the World - she can always be turned to in moments of frustration, of betrayal, of confused feelings and pain. Above her is Di Lac (Maitreya), fat and laughing, representative of a hopeful future, a time of plenty. 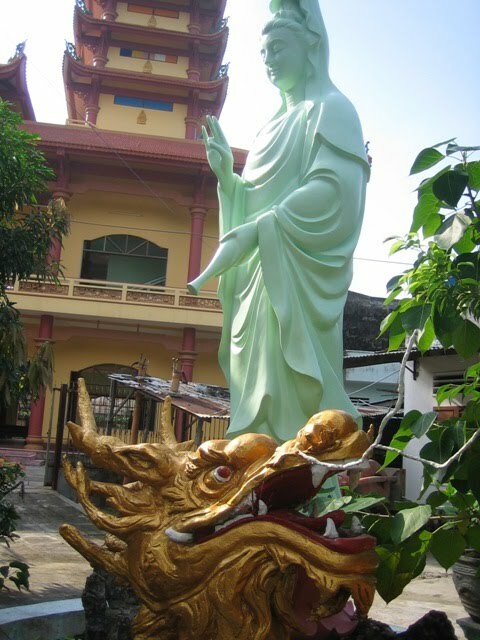 He always stands in a prominent place in Vietnamese temples, reminding us to retain our own lightness and sense of fun in the face of the often considerable sufferings of this world. 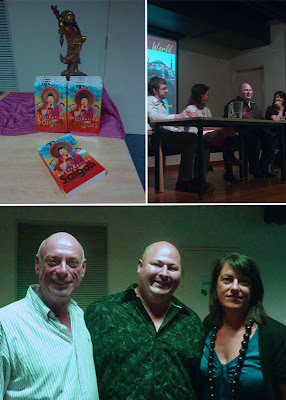 Great session today by SMSA, the first Travel Saturday, organised by Ambra. Pretty good crowd of around 70 in the audience talking about all things travel writing. Walter was on the panel with other travel writers, Erin O'Dwyer and Brendan Shanahan. I spent some time in Quang Tri, visiting the site of the apparitions of Our Lady of La Vang. What I love about these out-of-the-way places is that they tend to make peculiar claims for themselves. 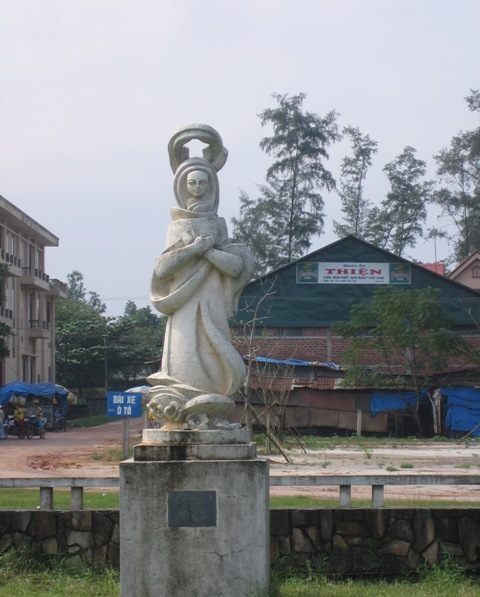 A winning claim, I should think – a real tourist magnet. It's a big call, I know, but I am about to name Sydney's 5 best Vietnamese restaurants. I realise that as soon as I do this I will be inundated with people saying "But what about..."
I concede that I have left some fantastic restaurants out, but I had to make a decision, and this is the outcome. One of the unifying themes across all of these restaurants is that none of them are really very fancy places. I can normally tell how bad a restaurant is going to be by quickly assessing its decor. The more stylish and designed a restaurant, the worse its food. No exceptions. My qualifications to make these judgements? I love food, and my partner and I eat out almost every night of the week - at least 3 or 4 of those nights being Vietnamese (as you'd expect). 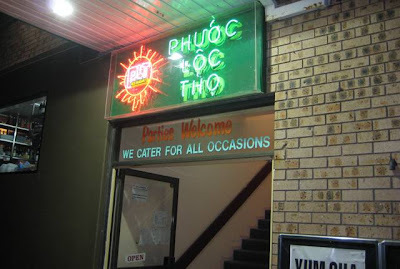 Phuoc Loc Tho - Situated upstairs on a side street in Canley Heights, Phuoc Loc Tho is easy to miss. But it prepares Sydney's best 7 Delights of Beef, a traditional Vietnamese banquet-style meal that presents 7 quite different dishes based on - you guessed it - beef. The charming proprietor has had a couple of very good restaurants all over Sydney over the years, and we have been fans of them all. Perfectly prepared, fresh, Southern cuisine at its absolute best - you can't go wrong here. If you don't feel like indulging with the 7 Delights, try some of the fry-and-roll-yourself dishes, and the Vietnamese salads and fresh rolls here are really top notch. Oh, and they do excellent sinh to, the sweet fruit shakes made with custard apple or avocado - a perfect dessert. 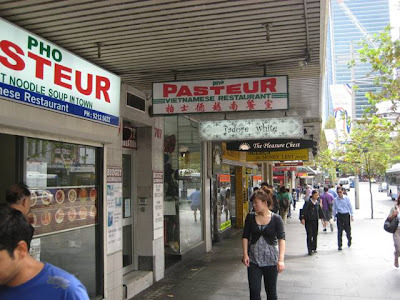 Pho Pasteur - Right in the sleaziest part of Chinatown (they have a sister restaurant in Bankstown), Pho Pasteur is one of the City's greatest treasures. It's never going to win any awards for service, but the pho here is among the best in Sydney, and the other fast and simple one-bowl dishes are all outstanding. It is incredibly crowded at lunch, but there is a quick turnaround of tables, so you won't have to wait for long. They stay open ytill 9, so it's a great (and cheap) after-work option. Apart from the pho, they also do a great bun cha gio (fried spring rolls served over noodles and salad) and a yummy bun nem nuong (barbecued meats served over noodles and salad). 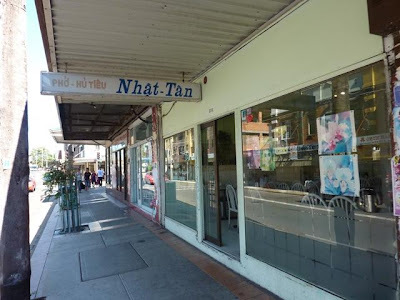 Nhat Tan - probably the humblest looking restaurant on the list, Nhat Tan is a Marrickville institution, though mostly frequented by Vietnamese. Primarily a noodle place, Nhat Tan has excellent pho, but also serves up a range of noodle dishes, and does really good cha gio (fried spring rolls) and goi cuon (fresh spring rolls). A small menu, but everything perfectly done. Trendy inner-city types normally head to other restaurants in Marrickville, but those in the know rate Nhat Tan as the most authentic and original. 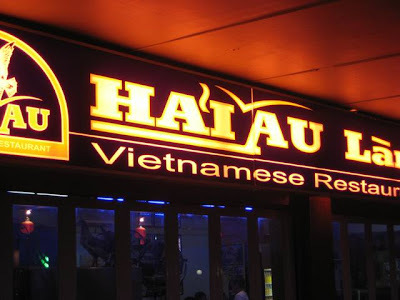 Hai Au - situated in Canley Vale, Hai Au started life as a tiny noodle shop close to the station. It got so that you could never get in, so delicious was the food, and so good its reputation. 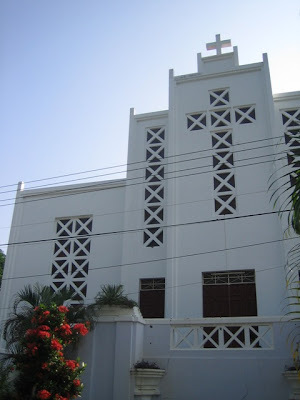 They moved onto much bigger premises down the road a few years ago, but on some nights you still can't get in. I have never had a bad meal at this place, and it is even starting to make a name for itself among the food reviewing elites. It charges a little more than other places nearby, but it can afford to, because the food is so consistently good. 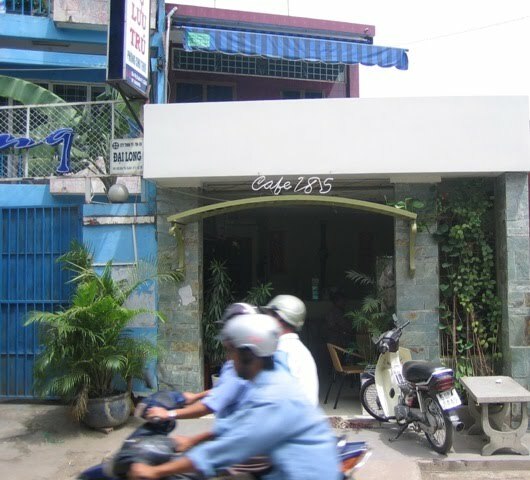 The staff are always happy and charming, though casual, and the food is served incredibly quickly. The canh chua (sour tamarind and fish soup), that staple of the Southern Vietnamese diet, is outstanding here - easily the best in the country. We also love the bo tiet bang - a delicous beef dish stir-fried with capsicum and pineapple and a wonderful sauce, and the suon rang muoi (salt and pepper pork ribs - very sinful, but irresistable!). The menu is full of amazing dishes, so get adventurous - try the bitter-melon salad if you're feeling really brave. Bau Truong - right in the heart of downtown Cabramatta, Bau Truong is easily the best general (i.e. 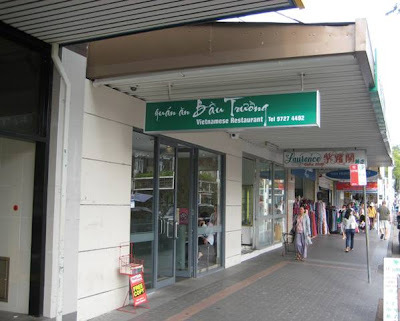 not specialising in a particular dish) Vietnamese restauant on the strip. The staff always speak English, and can be helpful if you don't know what to order. Consistently good, I like the way they serve the 7 Delights of beef - all on one platter to be shared by two people. Their bun dac biet (cold noodles served with everything) is absolutely delicious as well. 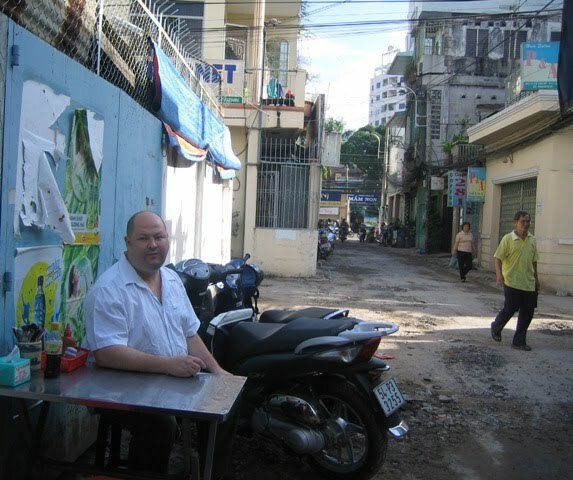 I was just reading a great blog post on Foodicles which was covering Viet food quite comprehensively, and I had a real ache for goi cuon, the fresh rolls that represent Vietnamese cuisine's most truly unique contribution to world gastronomy. I have always loved them, but I must admit I was surprised when they became such popular and trendy items on the Sydney scene. 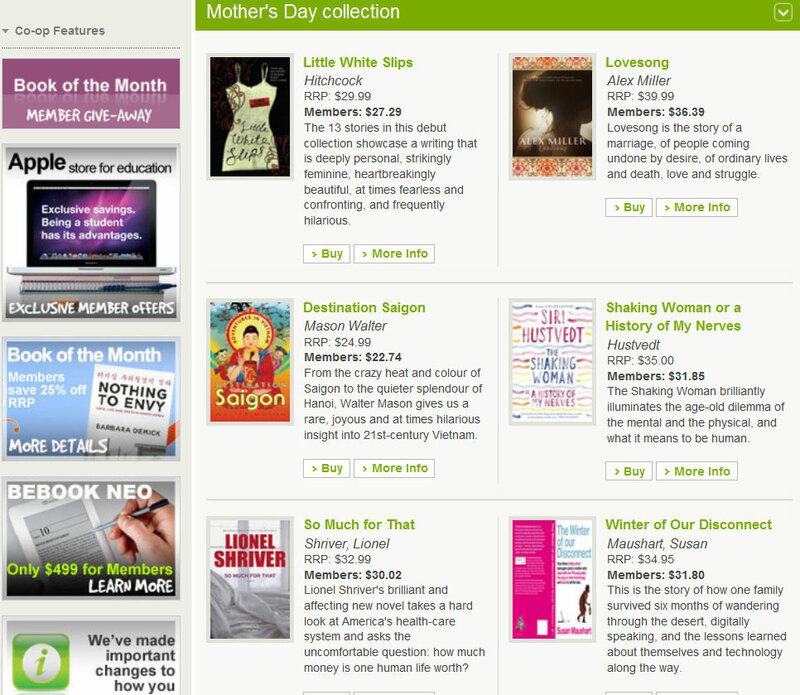 I was perplexed when they started turning up on platters at book launches and on menus at chi-chi Eastern suburbs cafes. I had always imagined that these cold and sticky rolls would always remain in the realm of the specialist foodie. How wrong I was. Indeed, these days in Sydney you can pick them up at sandwich shops and buy really horrible versions at Korean sushi stores in the city (filled with lettuce! 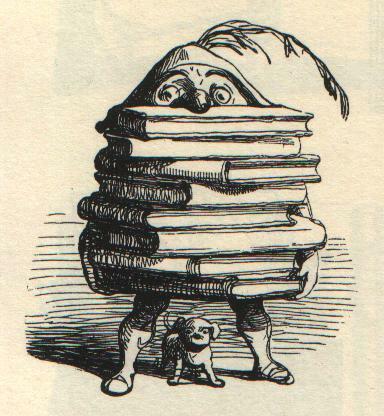 The horror!). Though they are popular in Vietnam, I have also seen something similar (and nowhere near as tasty) served on the streets of suburban Bangkok years ago - maybe introduced there by Viet migrants? Nha Trang style rolls are really trendy in Ho Chi Minh City right now, and I was always being taken to have them. 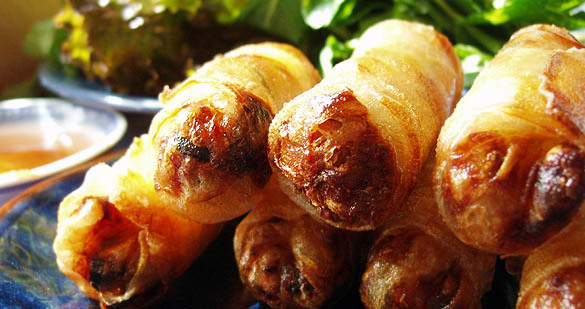 These are similar to the goi cuon fresh rolls, but instead of being wrapped in thin rice wrapper, you get yummy barbecued pork pieces wrapped in a fatter rice noodle, making them much more substantial. 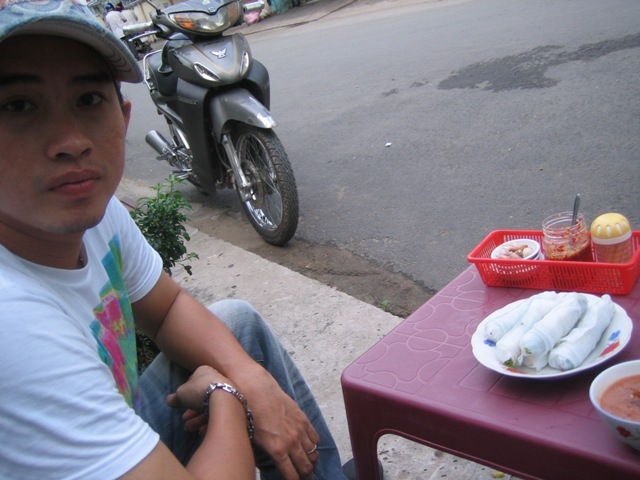 This is a pic of Kien at a little Nha Trang style fresh roll eatery right near our house in Tan Binh. 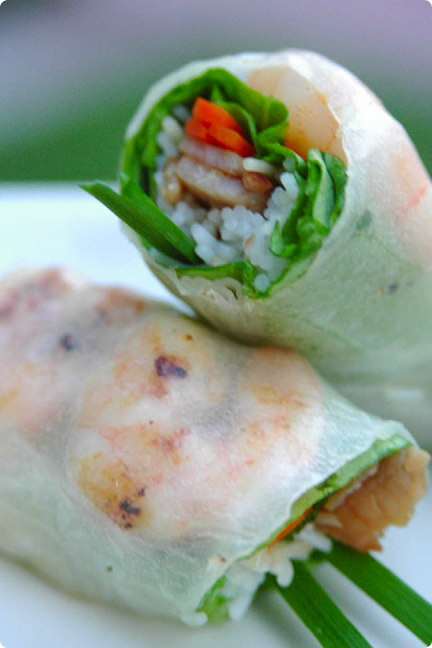 I tend to be a little bit sensitive about prawns, so these days I normally only eat vegeterian goi cuon. These are just as tasty, and a whole lot easier on the stomach. At Duy Linh vegetarian restaurant in Cabramatta (a regular hangout of mine) they also make a delicious vegan version of bi cuon, a variation on the fresh roll that is normally filled with fried pigs skin! The veg. version is much more palatable! 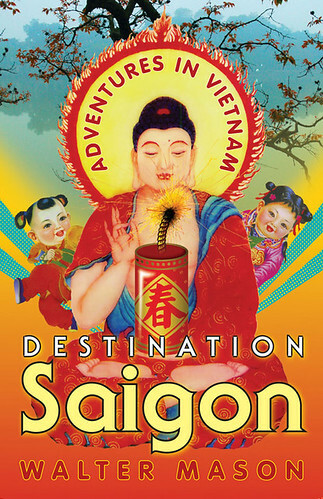 One of the people I acknowledge in the beginning of Destination Saigon is Thich Nhat Hanh. 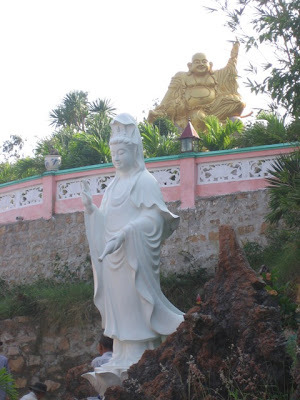 He is one of the great influences on my life and on my spiritual outlook, and I revere him as a great monk, a wise man and surely a Bodhisattva. Master Nhat Hanh has reached a grand old age, but he still seems sprightly and ready to do new things. He recently appeared on Oprah, for example, talking about his latest book, an examination of mindful eating written with a Harvard-trained dietitian. He really is amazing. He wasn't able to make it to the Parliament of World Religions in Melbourne last year (Australia is a long way away for a man of his advanced years), but he did record an extraordinary video address which excited and inspired many. 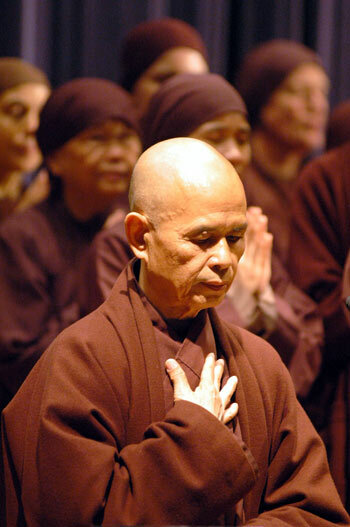 For me, Master Nhat Hanh's simple and unpretentious approach to meditation is his richest teaching. He encourages us to always keep a smile on our faces as we practice, so as top avoid taking ourselves and our religious goals too seriously. May he be blessed, and may he continue to live a long, happy and healthy life. We all pretend not to read the Lonely Planet guide, but of course we all do. And I'm not ashamed to say that the venerable LP has actually led me to some interesting places which have become very important to me on my life's journey. 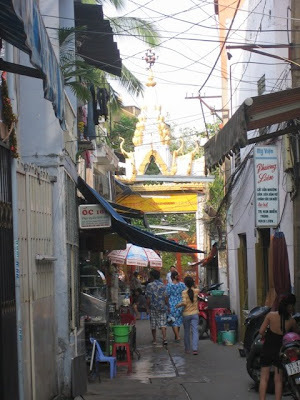 It has also led me to some shonky dives populated by whining Euro-backpackers complaining about the price of everything. In the former category is the gorgeous Kwan Yin Temple in Cholon, Ho Chi Minh City's Chinatown. 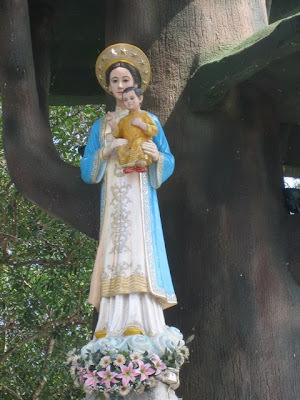 I would never have known about it without LP, and it has subsequently emerged as a significant spiritual site for me, and is one of the places I discuss in Destination Saigon. I first visited the wonderfully crowded and busy little temple back in 1994, which is when I first fell in love with it. However, it wasn't till I was living in Ho Chi Minh City in 1999 that I became truly fascinated by the place. Then I started to visit it weekly, and the people who lived and worked there became my friends. 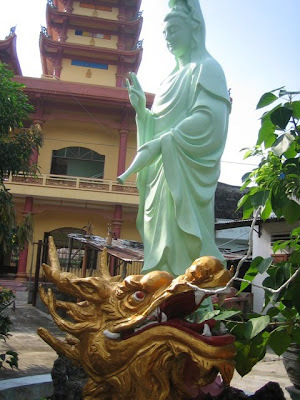 I have watched both them and the temple grow and change over the years, and it is a fascinating microcosmic study in the enormous social, econominc and cultural changes that Vietnam has experienced in the last 16 years. I do, one day, plan to write a book about it. The temple used to be extremely run-down and grotty. 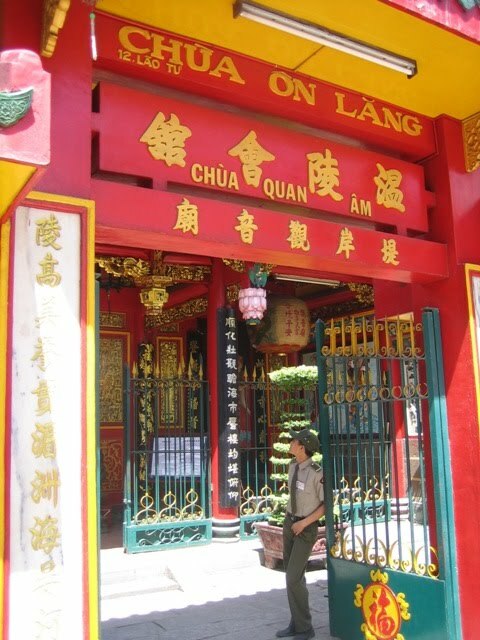 Situated rather romantically in an alleyway in Chinatown called "Lao Tzu Street," Chua Ba Quan Am (as it's known to locals) was an old, small and reasonably insignificant temple serving the Teo Chiew families living in that part of the City. But two things happened to it. 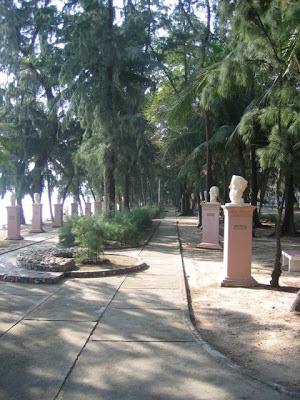 Firstly the good authors of the Lonely Planet's Vietnam guidebook discovered the place and fell in love with it. 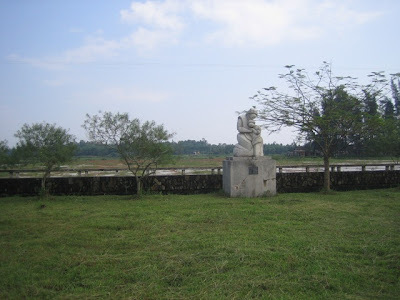 This meant that local tourist authorities started to be interested in it and contribute to its restoration and upkeep. 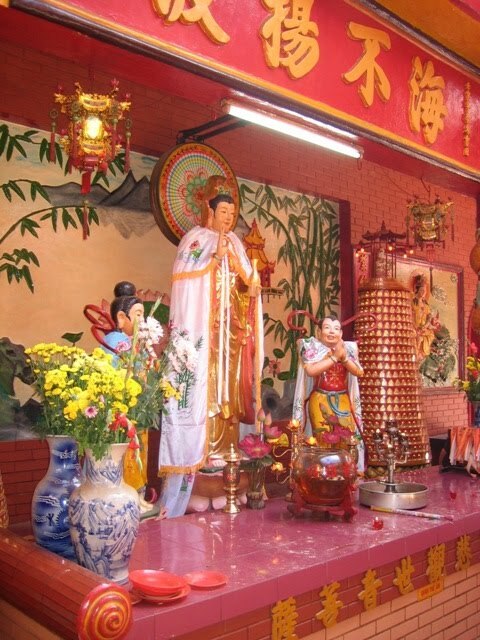 Then the Teo Chiew refugees living all over the world began to come back home, and they started to pump money into this little temple which they realised was possessed of great old-world charm. These days it's full of tourist faces. And the whole place has been cleaned up quite radically. 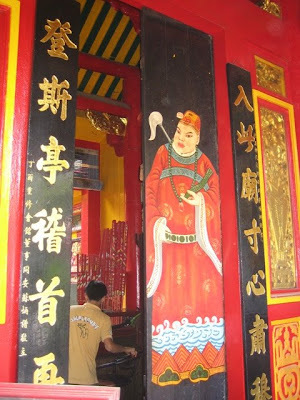 I used to sit in there for hours watching the shamanesses and fortune tellers at work while subtle beggars worked the crowd, though their presence inside was strictly forbidden even then. All that is gone now, and the staff are always elegantly got-out in uniforms and matching t-shirts. A far cry from the days when shirtless old men, half asleep in the heat, would wordlessly shuffle about attending to their chores, a cigarette hanging from their lips. 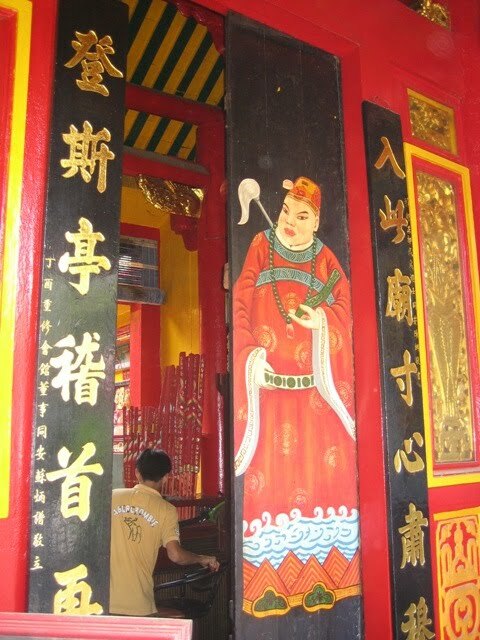 That said, it is still one of the most fascinating and colourful places to visit in Ho Chi Minh City, and should be on everyone's tourist agenda. 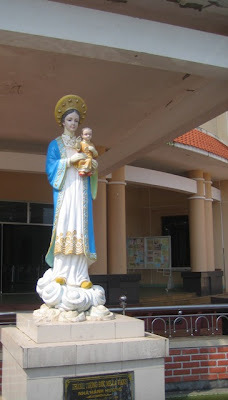 Ho Chi Minh City is crowded by anyone's estimation. Officially the population of the city is 9 million, though most experts say there are a couple of million on top of that. Even a cursory glance at the city's population will reveal that almost everyone you meet, and certainly everyone that works for you or serves you, is not officially a resident, so heaven knows how many people are actually living there. It is crowded and cramped, and real estate has become insanely expensive - buying a house in the city area is far more expensive than buying a house in Sydney, for example, but people earn only a fraction of what people in Australia earn, so in real terms the cost of housing is truly astronomical. So people tend to build up. Every time I return to Vietnam people in "The City" have added another floor to their houses, and long, steep and perilous stairways are very common in urban Saigon dwellings. One stumbles upon some quite extraordinary architecture, and a distinct "Saigon" look has emerged in the last few years. I love buying all the Home Beautiful style magazines when I am there to see how the rich are building and decorating their often quite tiny homes. 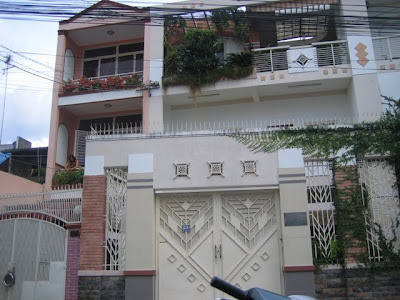 Getting around in Ho Chi Minh City can be quite difficult, with houses hidden down a bewildering series of alleys, leaving you looking for addresses like 1/6/31/8/ bis Pham Van Hai. Each number indicates an alley you need to turn down, and heaven help you if you make a wrong turn - re-tracing your steps can take up a lot of time, and leave you emerging into streets and districts you've never seen before. 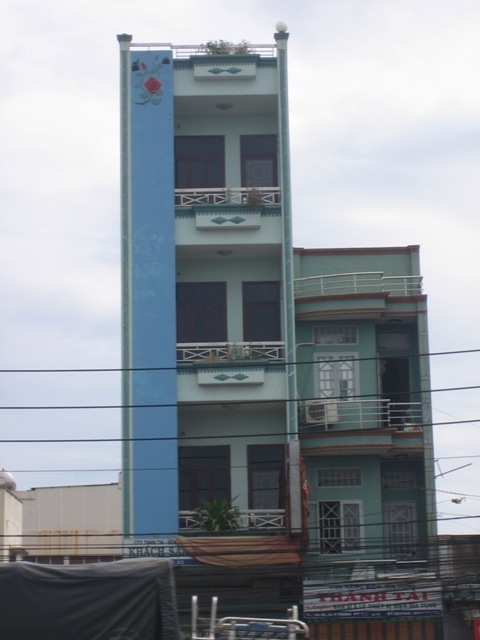 The residents of Saigon, too, are inveterate shopkeepers, and houses frequently feature a business of some sort in the downstairs front room. Frequently, in order to get to an actual house, you have to tramp through the premises of a cafe, a pharmacy or a dressmaker.